The Midas Touch and similar stories and parables all have the same conclusion – that when a person is given the ability to play god, the temptation of abuse is ever present because, as the saying goes, we are only human. It is a story that continues to resonate even to the present day where modern storytellers of all types utilize the basic narrative to teach the age-old lesson of the moral issues that come with such a heavy responsibility. Ruby Sparks is definitely another narrative that owes much to the classic tales of playing god, but does it do enough to distinguish itself from it’s inspirations and come out as a more unique tale? The end result may not completely be able to shake off the predictable narrative structure and some plot contrivances, but the exciting leads and the energy the film outputs is, at it’s best, a fascinating remodeling of the classic parable. 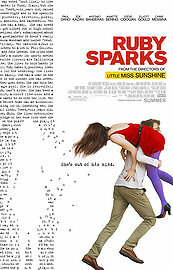 Ruby Sparks (Zoe Kazan) is the titular character of Calvin’s (Paul Dano) new novel – a girl he has been envisioning after encountering a severe case of writer’s block and depression. After talking with his shrink, Dr. Rosenthal (Elliot Gould), and getting disparaged for his lack of fitness and sexual prowess from his brother, Harry (Chris Messina), Calvin is motivated to pull it together and make his new novel works. That is, until a girl named Ruby appears out of nowhere and claims to be Ruby Sparks. At it’s weaker moments, Ruby Sparks feels too reliant on stories that have repeated similar themes and plot points before, not helped by some odd editing choices and overly bombastic score. As stated previously, the film definitely owes a lot of it to previous parables and stories that engage in similar material. Essentially a story of a creator and it’s creation, Sparks follows the path of it’s predecessors a bit too familiarly to really surprise the audience too much and most likely, you’ll be guessing the film’s journey at each turn. Of course, some may argue that Sparks does a decent enough job transplanting the characters and themes into modern senses but even then, I believe more could have been done to make the story it’s own than a sum of it’s parts. Not helping this feeling is the fade out editing. The film seems to divide itself into play-like acts with quite often, reappearing fades to black and lingering fade ins. Unfortunately, the momentum comes to quite a halt and the feeling of ‘sections’ than ‘a cohesive whole’ is felt. Actual cue cards or B-Roll transitions could have helped give the film a better flow or structure than the choppy feeling. Finally, the music seems too grandiose for the story. Inspired by a more Disney-esque, bombastic score rather than a quiet fascination, the music gave the proceedings (at times) a bit of a corny feeling than a quirky one. This problem didn’t come throughout the entire film but reared it’s head enough to be noticeable and affect the overall emotion of the film. That being said, Ruby Sparks has it’s two strong leads and sense of chemistry that help deliver the film’s empathy and a charm and respect for the happenings to become a good watch to the end. Kazan and Dano (along with much of the cast) bring a great sense of both weight and fantasy to their roles to help sell the idea of such a miraculous event and for the most part, they all do a solid job creating interesting relationships. Of course, it is Kazan and Dano as the two frontrunners that not only steal the show but really help to solidify it well. It doesn’t hurt that their real life relationship helps to sell such great chemistry but the roles themselves are just full of fun and glee. Dano especially is particularly a fascinating actor as he gives off a Woody Allen-esque performance that is both maniacal yet so intelligent. It was a delight to see him act and hope it won’t be the last. In addition, the plot, although simplistic and non-revelatory, still has a lot of respect for it’s characters and their happenings. Stories are fleshed out and the family, especially from Calvin’s side is taken cared of with some interesting insights throughout the film as well as the concept of Ruby herself which is kept in the fantastical realm. In this sense, there is an undeniable charm about the film with it’s concept not outliving it’s novelty and interest. Ruby Sparks is, at it’s best, an interesting parable on a young man learning about himself and love and at it’s worst, a retread of all-too-familiar tropes. The problems that the film has trouble overcoming are the familiar all-too-familiar aspects of it’s genie-in-a-bottle/Midas Touch story and the results and conclusions the film delves into aren’t quite as surprising as the film may be hyping. However, there is no denying that where the film may lack in surprising punches, it succeeds in creating both charm and respect for it’s material. The leads, Dano and Kazan, have a great chemistry (and Dano, especially, is a complete fascinating actor to keep an eye on for future roles) that especially pulls the film together. All-in-all, Ruby Sparks works as a film of lessons and morals that has a nice, youthful energy fueling it – hoping it infects you with the same amount of glee and fascination. It’s fascinating how many films can continue to peck at the concept of a relationship and the possible demise. Whether it’s a culmination of modern-day evolutions or a different perspective, it’s become a genre that may not have huge intricate differences amongst one another but the best definitely come out swinging with a unique perspective or just having a solid and capable foundation. Celeste and Jesse Forever isn’t a revolutionary romantic comedy by any means and approaches some of the common tropes and perception many have on the relationship and a break-up. However, there is no denying that the film can win open-minded audiences over with a fairly solid script and crew along with a lot of emotional care taken to view the female perspective of the break-up. Celeste and Jesse Forever follows a separated couple, Celeste (Rashida Jones) and Jesse (Andy Samberg) as they struggle to reconcile their close friendship with their impending divorce. Jesse is a struggling artist who doesn’t work while Celeste is a busy working as a brand marketer. Not helping the situation are their friends, Beth (Ari Graynor) and Tucker (Eric Olsen) who are planning to get married soon and have trouble hanging around the two of them at the same time. When Jesse finally finds someone new first, Celeste does not know what to do next or what to feel. The film’s weakest points come from it’s all-too-familiar tropes and a plot arch that feels a bit too long and meandering. Celeste and Jesse Forever doesn’t necessarily reveal anything new about relationships that hasn’t been discussed in the film medium before. True, it’s not a damaging point against the film but does create this sense of familiarity about where the plot is going and sometimes creates a lull when the film happens to follow your predicted path. Additionally, the film feels a bit too long in terms of the journey it takes to get from the beginning to the end of the narrative. Although it may play into the theme of emotional distraught that Celeste is going through and the roller coaster of emotions, it still feels as if there is not enough meat to the core story or the subplots and the plot feels like it drags after about three-fourths of the film. However, Forever’s strengths, insights and chemistry makes the final film a worthwhile endeavor. One of the easiest-to-spot strengths lie in it’s two leads, Jones and Samberg. They play off each other wonderfully both on a comedy-level (which isn’t too surprising) but also on a romantic drama level as well (which is much more surprising). The premise that they’re both best friends yet separated lovers creates a fascinating interplay between the two sides, creating both feelings of familiar laughter between the two and such animosity and tension as they begin their separation. Although definitely not as strong as the leads, Woods, Graynor, Olsen and Roberts have their comedic moments. Much of the success is also due to the fairly smart script and focus. Instead of focusing too much on the relationship or even the break-up itself, the film hones in on the aftermath and the complexities, mostly from Celeste’s point of view. This perspective and timing lets the film not only create some more unique scenarios than other films in its genre but using Jones as the center/focus gives it a fresher edge as well as both a character and a feminine lead in a full look at the evolution of a break-up. Not only is it driven by some fun comedic moments in light of the grim situation, the journey itself feels real and impactful as Celeste goes through each stage and tries to reason why things are happening. Rounding out the film is some good cinematography work and a consistent, indie soundtrack that adds a lot of flavor to the film. Celeste and Jesse Forever is not a revolutionary romantic comedy film but one that respects it’s characters and their struggles to great depths in trying to understand a break-up between best friends. The overall film does feel a bit long-winded and the subject matter and revelations are not uncommon to any seasoned moviegoer. However, the approach taken here creates a fascinating journey of the highs and lows of such a tumultuous break-up from mainly Celeste’s point of view and succeeds in creating real and empathic characters while injecting some mostly well-timed humorous quips throughout, helped by a smart and consistent indie-driven soundtrack, great chemistry between Jones and Samberg and fairly good writing. Forever at it’s best felt when respects the relationship and challenges viewers to ask more about not the break-up but the aftermath no matter how bad the timing and placement may be.